SuperDuperDad is not known for beating around the bush, nor for pulling punches. Like most NYC parents my time is valuable (more valuable than YOURS, you lolly-gagging, single youngsters and ye’ slothful childless middle-aged-sters!) And as I’ve written previously, one must measure each activities’ worth in relation to time, money and energy expended for it’s fulfillment. 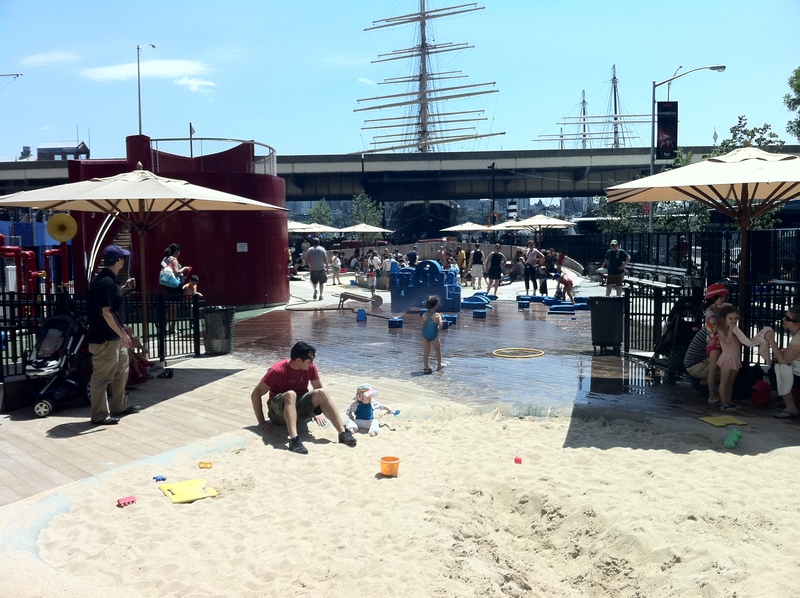 Between the $20 for parking and the time to hike out to Southstreet Seaport, the much lauded artsy-fartsy playspot Imagination Playground comes up a bust. 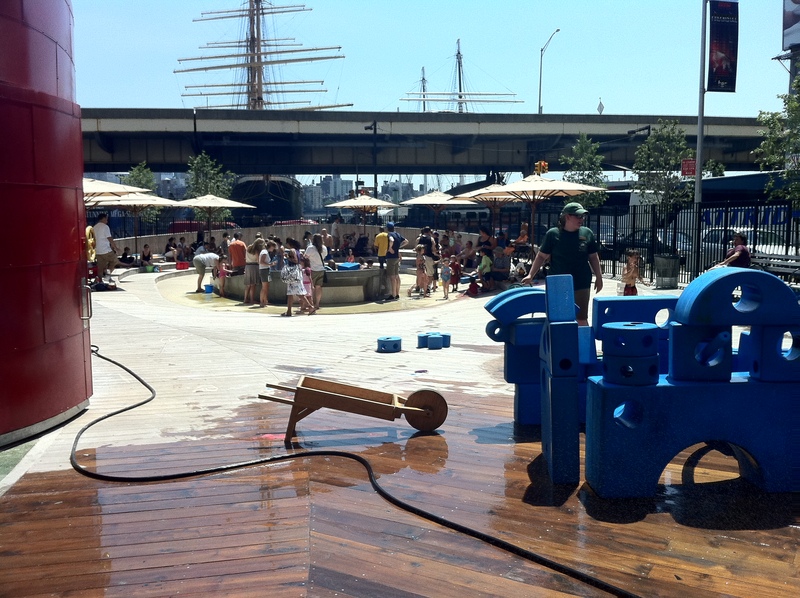 Firstly, despite the creator’s pretentious musings about designing a playground that contains “three core concepts that foster a dynamic, child-centered environment,” it’s still basically just some soft building blocks, fountains, net crawls and ummm… well that’s about it. There’s also some elaborate pully-system-ed sand-carrier that kind of falls flat and one of those walkie-talkie microphone thing-a-ma-bobs which I could not quite figure out. Further eroding the potential for fun, the park is staffed with earnest, friendly, well-meaning college-student types (Ooooh, I’m sorry, “Play Associates” according to the website) who are ready to extinguish the sometimes rowdy flame of fun that can ignite during standard childs’ play. As can only happen to SuperDuperDad, one young woman approached me after I knocked down several large building blocks while engaging SuperDuperKid in a mock battle for Imagination Park Supremacy. “I gotcha,” I said, in no mood to tangle with this creature of awkward kindness who nonetheless saw fit to kill any sign of reckless fun the second it reared its joyful head. And despite what multiple websites claim, bringing a kid here who is over nine is pushing it, indeed. It’s undoubtedly best for the toddler set. It should be noted that although I’d like to think of myself as an expert on what intrigues the youngsters, one bespectacled 11 year old, perhaps sensing my distaste, quickly stated that the I.P was one of his favorite-est places. “Because, um, it has my favorite things to do…” he stammered, wandering off in mid-thought. I wondered if perhaps he needed to get out of the Bronx a bit more. Here though, I must touch on a point I’ve made in multiple writings past: Kids have an endless and insatiable sense of wonder which any resourceful parent can tap at will. I always believe that myself and SDK can have a great time anywhere we go, be it a Ukrainian gulag or the DMV. The I.P is after all a playground, no matter what pretensions adults attempt to heap upon it. Sprinklers transcend any and all circumstances and if your kid can’t have fun in the water, you best rush them to the child psych ward ASAP. If you’re in the area checking out the fantastic Bodies exhibit (fascinating for kids, if a tad graphic) or enjoying one of the splendid beer sampler packages at Heartland Brewery, then by all means treat the lil’ ones and pop into the I.P. Otherwise stick with the Imagination Playground in your head. Parking is always free there! Official SuperDuperDad Yay or Nay Verdict: Nay, thanks. Details: Although it’s possible, avoid driving at all costs. Even for a master like SDD it’s a challenge. Parking for an hour or so will be $20-25 in local lots. Limited metered parking will be available — several garages are located on nearby Pearl Street. When you exit the subway walk east on Fulton Street and then turn right for one block on South Street. Imagination Playground at Burling Slip will be on your right. Thank you for this review… I was thinking about taking my 2 toddlers down here on saturday… But with the review of parking and staff It sounds fun for the kids but stressful for parents. My toddlers are maniacs… climbing, screaming, running, FUN maniacs. I’ll just stick to the local sprinklers. Thanks for reading, Deb! Do keep in mind that if you’re in the area anyway, I would say you should pop in. Also, make sure and subscribe to the blog for other great NYC kid-related info!